This Kickstarter project is aiming to bring the ‘Crooked Claw’ 28mm figure range back to life, with lots of new miniature sculpts from the master of Goblin sculpting – Kev Adams. This is a range of classic-looking Goblin miniatures, and well worth a look. The project has reached 280% of it’s 5,000 EUR goal, and is due to finish on the 4th October, with delivery due in November 2016. Bombshell Miniatures are running a project to create some new 28mm female character figures for tabletop gaming. The project has reached 160% of its $9,000 funding goal, and is due to finish on the 1st October, with delivery in June 2017. A new range of 28mm Sci-Fi civilains, with a distinctly different look – very VSF. The project has reached 250% of its 3,000EUR funding goal, and is running until the 20th October. Delivery is due in December 2016. Nexus & Alliance Starter Sets. A couple of years ago, Icarus Miniatures had a failed KS project to launch a new game – the Icarus Project. Now they are back with a new project to fund two 35mm miniatures starter sets: the Nexus and the Alliance. Blackwater Gultch is a skirmish wargame, set in the Oild West, but with a horror twist, with gangs including humans, undead and ‘skinwalkers’. The second edition includes new loot and character cards as well as the rulebook. The project has reached 88% of it’s $20,000 funding goal, but is due to finish on 26th September, so if you want to get on board with this and see it happen, you’d best be quick. Delivery is due in June 2017. Battle Valor Games started to release 15mm fantasy armies earlier this year – now they are looking to bring a tabletop wargame to market. The project is to fund production of the rules, with extra pledge levels including miniature packs. At time of writing, the project is just over 35% funded of their $10,000 goal. The project is due to finish on the 18th October, with delivery scheduled for August 2017. Following on from the hugely popular Heroes of Normandie boardgame, Devil Pig Games are back with a Card Game variant. This time, the game is much higher level, with cards depicting companies rather than squads. Gameplay is advertised to be ‘fast and furious’ with games lasting 30-45 minutes. The Project has already hit almost 500% of it’s 10,000 EUR funding goal, with several stretch goals already available. With a pleadge of 30 EUR or 45 EUR, this is well worth a look. 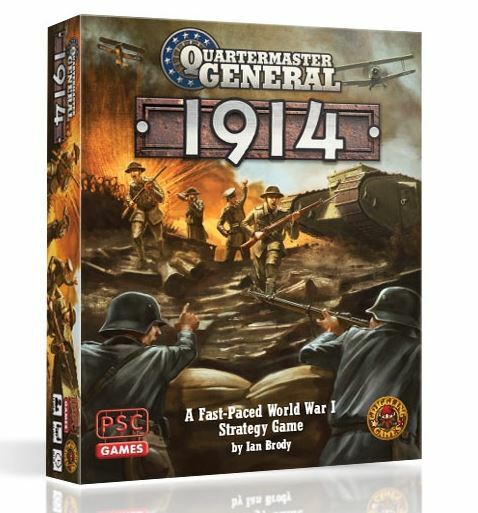 PSC Games are currently funding a Kickstarter project for their second variant on the Quartermaster General boardgame, although this isn’t so much a Kickstarter as a pre-order, as the game is already in production and is due for release at Essen in October. Essentially, if you back this project you get the game at a discount price, with an even better deal for this as a bundle with the previous Victory or Death game. The project is almost at 400% of it’s £4,000 funding goal, and is due for delivery in October 2016. The project is running until the 7th October 2016. This is a project which is at the heart of what Kickstarter is all about – someone looking to take something that they do ‘in the garage’, and turn it into a fully fledged business. Wizard Kraft make modular terrain (Rivers, roads, fields etc). They are looking to raise $10,000, and are currently 20% funded – the project is due to finish on the 7th October. which is also now referenced on the KS site (with my OK). I recommend them enthusiastically and without hesitation. He hopes to expand to many other terrain items as well.